Goat diary is a gift from God. I gave up cow’s milk and everything made with it about 3 years ago, and renouncing the mucus-forming, antibiotic-laden, digestion-clogging gook was easy with a little help from a righteous goat. Without throwing too many cheap shots at the poor, holy cow, I want to explain the basic differences between cow and goat dairy to illustrate why making the switch is an excellent idea for you and your family. Our bodies were designed to consume human milk, a perfect food for growing babies. We are born with the ability to digest our mother’s milk, but many people become lactose-intolerant as teens or adults, when our bodies stop producing the enzymes necessary to digest any kind of milk. Goat milk has smaller protein molecules than cow milk, the most similar to the protein found in human milk. In addition, the fat molecules in goat milk have thinner, more fragile membranes – half the size of those in cow milk. This leads to an average curd tension that is literally 1⁄2 that of cow milk (36 grams for goat milk and 70 grams for cow milk). Curds from milk form in the digestive tract or during cheese or yogurt making (anywhere that the milk is subjected to acid). Having less curd tension means that the milk is less “tough”, and easier to digest. Dr. Bernard Jensen (my personal hero) showed that goat milk will digest in a baby’s stomach in 20 minutes, whereas pasteurized cow milk takes 8 hours. The difference is in the structure of the milk. Compared to cow dairy, goat dairy contains more calcium, phosphorous, vitamin A, riboflavin, thiamine, selemium and less cholesterol! Goat milk does not contain the complex of proteins that are the main stimulants of allergic reactions to cow dairy products. Therefore, it does not stress/depress the immune system. Seven percent (7%) of U.S. children show symptoms of cow-milk allergy such as wheezing, congestion, frequent ear infections, eczema, skin rashes and digestive troubles. In the vast majority of cases, these problems are often eliminated when goat milk is substituted for cow’s milk. Goat milk and goat milk products can be tolerated by most of those who are lactose intolerant. Because unpasteurized goat milk is digested very rapidly, lactose (the main sugar found in milk), does not remain for long periods of time in the intestines, where it can ferment or cause an osmotic imbalance, followed by digestive upset. Additionally, goat milk contains 7% less lactose than cow milk. Goat milk is a rare dairy food in that it has an alkaline ash. This means that it does not produce acid in the intestinal system. Acidic blood and intestinal pH levels have been associated by researchers with fatigue, headaches, muscle aches and pains, sore pressure points, excess weight, blood sugar imbalances, and excessive yeast populations. Goat milk helps to increase the pH of the blood stream because it is the highest dairy product in the amino acid L-glutamine, an alkalinizing amino acid. In comparison to cow milk, goat milk contains twice the content of medium chain fatty acids, such as capric and caprylic acids. These fatty acids are highly antimicrobial. Capric and caprylic acids are used today in dietary supplements to inhibit the growth of Candida albicans and other yeast species. They also boost the immune system and enhance energy. While in the North America, we may think of goat’s milk as a beverage alternative to cow’s milk, in most areas of the world, the opposite is true. Worldwide, more people drink goat’s milk than cow’s milk. The same goes for it’s fermented friend, yogurt. This is my favorite easy-to-digest indulgence in the morning: a frozen banana, handful of wild blueberries and about a ½ cup of goat’s yogurt. Blend it until smooth and I’ve got a fully loaded breakfast that’s great on the go. I just pour it into a mason jar and make everyone on the subway jealous! This also a delicious dessert. Goat cheese comes in many forms too. We are all familiar with the soft, spreadable type, but goat cheddar, mozzarella, and feta are also available. 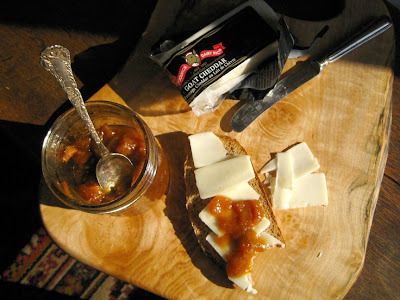 I love to put a couple slices of goat cheddar on crusty, whole-grain bread with some jam (the best is my friend Kaitlin’s organic peach and ginger jam that she bestows upon me after the summer harvest. She’s such a lovely girl). This satisfies my craving for a salty-sweet snack, while supplying me with fiber, protein and calcium! 1. Chop the apples and toss immediately with lemon juice to prevent browning. 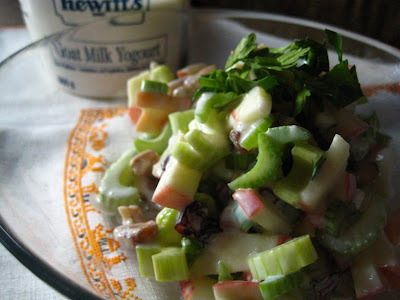 Chop the celery and walnuts. Add raisins. 2. Combine the yogurt and maple syrup or other sweetener. 3. Toss all ingredients together and serve. I hope that I have inspired you to try some goat dairy – there are so many ways to enjoy this delightfully digestible food and many are found at a regular grocery store (a small miracle for those of you who have not yet ventured into a health food emporium). 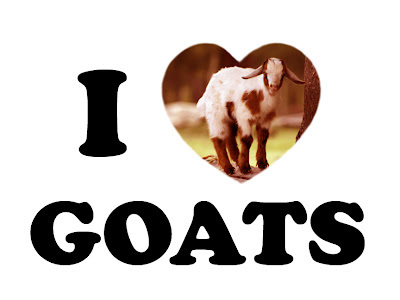 There’s a goat lover in all of us, unleash yours today! My aunt taught me when I was a kid in the 1950’s about Dr. Bernard Jensen. My Dermatologist told me not to eat or drink anything from a cow because of antibiotics they give to cows gets in our guts. I buy powdered goat milk I mix with water. I have severe reflux and metaplasia which is precancerous cells where my stomach empties into my colon and where it attaches to myesophagus. I am trying to lower my acidic levels and I’m doing a completely alkaline and dairy-free and sugar-free gluten-free diet. Mainly because a lot of those items are very acidic. I am just trying out goats yogurt and goats milk. I would also like to try sheep’s yogurt but I cannot find it being sold anywhere. Do you have any recommendations for a place where I can purchase sheeps yogurt as well? I was wondering about sheep’s milk, does it get digested just as easily as goat’s milk? Drinking unpasteurized cow’s milk solves most of the problems associated with cow’s dairy, doesn’t it? There seems to be evidence that it can also ease allergies, that without pasteurization the enzymes needed to digest it properly are still there, and that it has a lot of beneficial antimicrobial bacteria (which is otherwise destroyed during pasteurization). I hope your thinking about taking away her food every time you drink it. Any advice on where to buy goat milk and/or cheese in Copenhagen other than Irma? Thanks in advance! You can mail order goat milk and cheese from Myenberg in California. Sold! I’m buying a goat. But please let’s not forget that the kid should be getting the goat’s milk. It saddens me to see the baby goats taken from their mother’s only to be fed powdered formula. This is what happens where I live. Not sure if it is the same in Sweden. This is such a wonderful post I’m going to put a link under my “helpful links” tab! I absolutely love goat milk, yogurt and cheese but haven’t had any in the past few weeks as I was giving up all animal protiens. I might add some goat back occasionally. I already buy it for my allergic-to-everything daughter so I won’t feel bad about indulging every now and then! One of my favorite Scottsdale Chefs (Becky from The Herb Box) sent me the link to your blog and this post. I read it on my pda while hand milking (yeah, i can do that) Lavender – the first of four Nubian does I milk twice a day. Great post. Love it when people shout out about the wonders and value of what is good and right about goats milk. We’re suburban farmers and our farm here in Scottsdale is called The Simple Farm. We’ve got a face book page to see more of what we do. I’ve been drinking goat’s milk in my tea since I saw your post and decided to give it a try (I don’t drink much milk…) and I have to say that despite the ever so slightly goat-y taste it really is quite nice and flavourful in my tea. I thought that jam jar looked familiar…you’re such a lovely girl! thanks so much for this post, sarah! I’ve been lactose intolerant since I was 13, and have been happily indulging in fresh goats cheese for a few years now – never had a single reaction to it! I can attest to the tastiness of other goat-milk cheeses as well. however, i’ve only ever had the odd taste of goats milk, and gave up on it due to the *goaty* flavour, but I must not have been tasting the GOOD stuff! So, my interest is peaked, i will definitely be trying it again! Thanks! !